Frontispiece; Contributors; Introduction P. B. Stacey and W. D. Koenig; 1. Splendid Fairy-wrens: demonstrating the importance of longevity I. C. R. Rowley and E. Russell; 2. Green Woodhoopoes: life history traits and sociality J. D. Ligon and S. H. Ligon; 3. Red-cockaded Woodpeckers: a 'primitive' cooperative breeder J. R. Walters; 4. Arabian Babblers: the quest for social status in a cooperative breeder A. Zahavi; 5. Hoatzins: cooperative breeding in a folivorous neotropical bird S. D. Strahl and A. Schmitz; 6. Campylorhynchus wrens: the ecology of delayed dispersal and cooperation in the Venezuelan savanna K. N. Rabenold; 7. Pinyon Jays: making the best of a bad situation by helping J. M. Marzluff and R. P. Balda; 8. Florida Scrub Jays: a synopsis after 18 years of study G. E. Woolfenden and J. W. Fitzpatrick; 9. Mexican Jays: uncooperative breeding J. L. Brown and E. R. Brown; 10. Galápagos mockingbirds: territorial cooperative breeding in a climatically variable environment R. L. Curry and P. R. Grant; 11. Groove-billed Anis: joint-nesting in a tropical cuckoo R. R. Koford, B. S. Bowen and S. L. Vehrencamp; 12. Galápagos and Harris' Hawks: divergent causes of sociality in two raptors J. Faaborg and J. C. Bednarz; 13. Pukeko: different approaches and some different answers J. L. Craig and I. G. Jamieson; 14. Acorn Woodpeckers: group-living and food storage under contrasting ecological conditions W. D. Koenig and P. B. Stacey; 15. Dunnocks: cooperation and conflict among males and females in a variable mating system N. B. Davies; 16. White-fronted Bee-eaters: helping in a colonially nesting species S. T. Emlen; 17. 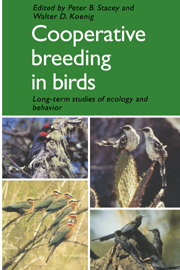 Pied Kingfishers: ecological causes and reproductive consequences of cooperative breeding H.-U. Reyer; 18. Noisy Miners: variations on the theme of communality D. D. Dow and M. J. Whitmore; Summary J. N. M. Smith; Index.